Pick up PES 2011 for just 69p! To celebrate thanksgiving (you know, that holiday they celebrate in the United States and Canada! ), Konami are offering all their fans with a fantastic bargain. 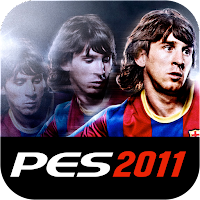 You can pick up PES 2011 from the App Store for just 69p - or $0.99 if you're from the US! The offer ends this Sunday (November 27th), so be quick to take advantage of this deal.